The Islamic finance industry’s leading certification institute, Ethica, today launched what may soon become the desktop reference of choice for the Islamic finance professional: a 700 page e-book packed with practical, usable information. Everything from sample Islamic finance contracts, over 1,000+ scholar-approved Q&As, the entire “Meezan Bank Guide to Islamic Banking,” study notes to Ethica’s award-winning Certified Islamic Finance Executive (CIFE) program, and much more. All organized with an easy-to-use subject index at the end. What makes the e-book unique is that it emphasizes entrepreneurship. Sample contracts, product descriptions, and recommended reading lists target the newcomer who may not necessarily be interested in lining up for a job at a big bank. His horizons may extend to the entrepreneurial side of Islamic finance, which continues to be top-heavy with large banks dominating the headlines and smaller companies and start-ups largely absent from the industry. 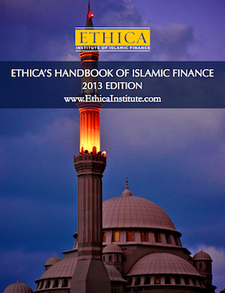 Ethica’s “Handbook of Islamic Finance (2013)” is now available free of charge. Winner of “Best Islamic Finance Qualification” at the Global Islamic Finance Awards, Ethica is chosen by more professionals for Islamic finance certification than any other organization in the world. With over 20,000 paying professionals in 47 countries, the Dubai-based institute serves banks, universities, and professionals across over 100 organizations with its 4-month Certified Islamic Finance Executive (CIFE) program delivered 100% online. The CIFE is the only globally recognized certificate accredited by scholars to fully comply with AAOIFI, the world’s leading Islamic finance standard. To watch an Ethica training video click here. This entry was posted in Current trends and news. Bookmark the permalink.